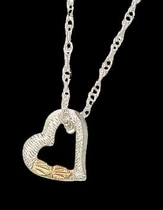 Heart pendant with open styling by Landstrom's Black Hills Gold. 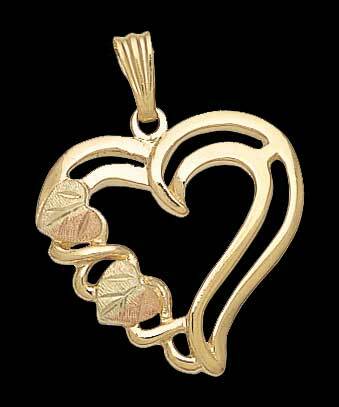 Elegant 10 karat gold heart. Leaf accents are 12 karat gold. Comes with an 18 inch gold chain and elegant gift box. Usually ships in 3 - 4 business days. See our other Black Hills Gold Necklaces. Read about the Black Hills Gold legend. Learn how Black Hills Gold is made.